These sturdy DIN rail mounting brackets come in handy for a wide variety of projects where standard DIN rail is used for mounting devices. The flat mounting surface and a total of five mounting holes make this clip versatile for mounting devices that do not have their own DIN rail mounting clip. All of these clips are for standard 35mm DIN rail and work with rail depths of 7.5mm or greater. 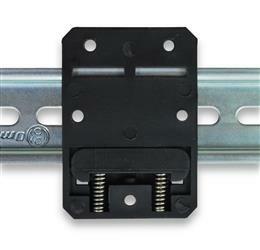 These clips are sometimes known as DIN rail mounting plates. This clip style comes in three different sizes. Please see datasheets below for dimensions. We also offer another style of narrower, taller clips; see part number DINM01. These clips are very easily attached and detached from the DIN rail. When on the rail, the clip "grips" the rail on both the top and bottom lips of the rail. The "fixed" (not spring-loaded) tab of the clip should go on the top so that it bears the load. The spring-loaded tab should go on the bottom. To remove the DIN clip from the rail, simply push upwards on the DIN clip (thereby compressing the springs in the bottom), pivot the top of the clip off of the rail, and then move the whole clip down to also release the bottom of the clip. No screwdrivers or special tools are required. The screw holes in this clip are non-threaded, nor are they intended to be threaded into. Intended usage is for the screw to pass through the clip and thread into the device being mounted. The holes allow up to a #8 machine screw or a #6 sheet metal screw to pass through (a #8 sheet metal screw will NOT pass cleanly through the holes, although a #8 machine screw does fit). Note that the surface of the device being mounted to the DIN clip should be flat and cover the DIN clip in order to keep the springs and latch portion of the clip securely in place. Winford Engineering offers mounting screws, washers, and nuts for use with this clip. This hardware is RoHS Compliant and affordably priced. See the Pricing and Ordering tables below or our Hardware section for hardware pricing and options. The DINM15-RC and DINM15V2-RC clips are very similar to each other. The difference is a slight change in mounting hole locations. The DINM15V2-RC is the newer model and is recommended for new applications, but the DINM15-RC is still available for legacy designs. We will continue to stock both part numbers. For details of the differences between these parts, please reference the data sheets below. We offer mounting hardware compatible with these clips; the 7/16" or 1/2" screw length is recommended for mounting to 0.062" panel or PCBs using nuts.